Eeu de Lacoste L.12.12 captures not just the spirit of the brand but transforms fragrance notes into abstract moods and emotions to evoke the very spirit of the iconic shirt - unforgettably cool, crisp, elegant and audaciously stylish. In essence the confidence a man feels when he puts on a classic Lacoste L.12.12 polo shirt. Cool and crisp as a fresh polo shirt. It opens with refreshing grapefruit, laced with the spice of cardamom and rosemary, around a passionate and idiosyncratic tuberose heart. Leather, suede, vetiver and cedar wood lend an insouciant masculinity to its base. Eeu de Lacoste L.12.12 Blanc is a pure, clean day scent. 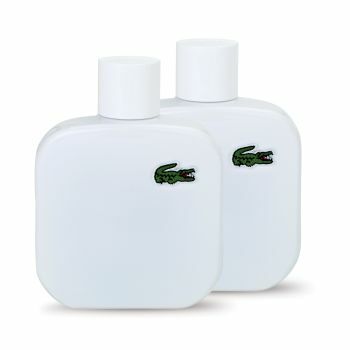 The Lacoste L.12.12 Blanc duo set contains 2 Eau de Lacoste L.12.12 Blanc 100ml.